Wavefront technology was originally pioneered in the field of astronomy and physics to aid in reducing "aberrations" or imperfections in the multiple lenses of telescopes. In much the same way, we use LADARWave� to provide us with an accurate assessment of the optical imperfections found in the entire eye's optical system. Robbins Laser Site is the first in Upstate New York to offer CUSTOMCORNEA� utilizing LADARWave� wavefront technology to measure and address both lower and higher order aberrations (visual imperfections in the eye's optical system). Unless both lower and higher order aberrations are addressed during laser vision correction, the quality of your vision may not be ideal, even if you have post-operative vision of 20/20. First, flat waves of light are passed through your eye using a computerized wavefront-measuring instrument called LADARWave�. As the light waves travel through your eye's optical system, the imperfections in the eye distort the flat light waves. LADARWave� captures them to the perfectly flat light waves that would have been reflected if your optical system had no distortions. Next, a 3-D map is generated representing your unique visual distortions, including both lower and higher order aberrations. This map is then transferred to the LADARVision� 4000 Excimer Laser, and guides the laser as it reshapes your cornea, providing you with a truly customized laser vision procedure called CUSTOMCORNEA�. Contact our office to discover how LADARWave� and CUSTOMCORNEA� can give you the vision that you have always wanted. Learn about the payment options available to our patients. 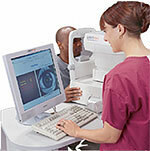 Schedule your screening appointment today and see if you are a good candidate for Laser Vision Correction. At the Robbins Laser Site in Rochester, New York, Ladarwave and laser vision correction surgeon Dr. Allan Robbins will recommend and provide the laser eye surgery that is right for you. Dr. Robbins recommendations are made after consideration of all the options available for your laser vision correction surgery including CRT, CustomCornea, Ladervision, Laderwave, Lasek, Lasik, PRK, RK, Technolas, VISX or Wavefront. For laser vision correction eye surgery in the Upstate New York area including Rochester, Corning, Elmira and Hornell, NY, Contact Us to schedule your free laser vision correction consultation with Dr. Robbins.This website is not intended for viewing or usage by European Union citizens.